Spy ® Detectors offer accurate, reliable inspection of pipe coating, tracking pigs, locating underground cables and pipelines or locating leaks in pipe, offshore or onshore. Technology that combines the case, probe and electrode configuration with new generation solid-state circuitry. Check your detectors voltage output with different voltage jeepmeters. 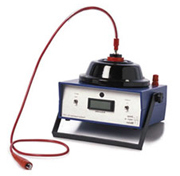 Model JM features a digital display and measures up to 40 kv. Model PJM jeepmeters are pocket size that measure 0 – 20 kv. Compact, lightweight - no bulky battery packs. 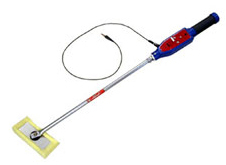 Uses standard 9-V battery and flat sponge electrode. Electronic pig tracking and locating system. Senses and signals passage of a Spy® Pig Tracker equipped pig.